"SapphireOne has transformed into one of the most comprehensive ERP and financial management solutions available." Robert Grant is very relaxed about his business transition from snow sports and equipment to primarily Hoka One One running shoes. In Australia, the snow season can be very short and cramming your annual sales into a few short months can be a headache and a cashflow challenge. In comparison, people buy running shoes all year round, providing a much more stable line of products to work with. 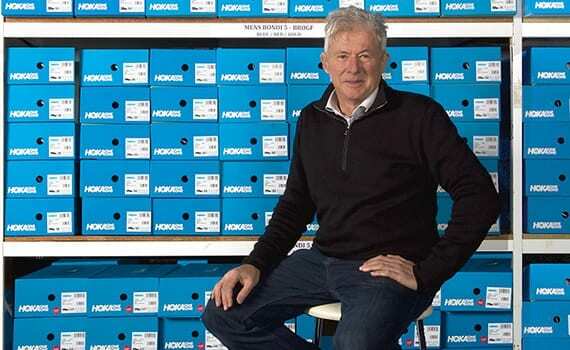 Today, Reflex Sports is the exclusive Australian distributor for Hoka One One and Sidas. Proud users of SapphireOne since 1995. And perhaps the only thing that hasn’t changed in Robert’s business since 1995 is his choice of business accounting software: SapphireOne. Of course, during that time, SapphireOne has transformed into one of the most comprehensive ERP and financial management solutions available. It has kept abreast of developments in business reporting and financial processes, meeting the specific needs of many different businesses, including Reflex Sports. “Way back in the 1990s, SapphireOne was one of the few accounting packages that worked on a Mac, but what really sold us was the matrix format used for inventory. Initially in the ski industry, and now in the running shoe business, we always have an issue with different sizes and colours for what is essentially the same product. “Most accounting platforms require you to set up each size and colour combination as a separate line item. You might have three models in four colours and ten sizes and that means printing out a price list three or four pages long. Robert is very committed to finding efficiencies in his business model and this has led him to incorporate Brandscope into his sales workflow. “Brandscope is a third-party package into which we load all our products for sale B2B and it fully integrates with SapphireOne. “We then give our customers access to Brandscope which they use to order stock. They can see immediately what we have available and what will need to be ordered in. We find that our retailers check what’s available and adjust their order accordingly, all without having to contact us directly. When they press the ‘go’ button, their order is transmitted directly into SapphireOne here. All we have to do is print out the picking list, dispatch the order and send the invoice. “What’s really pleasing is that our customers seem to be ordering more through Brandscope than when we’d contact them directly. Customers are given a user ID and password for Brankscope, so they can login whenever they like, and stock levels are updated every night, ready for access the following day. Robert says he maintains his on-road sales force because personal contact is still very important. “Our reps might visit busy shops fortnightly and smaller outlets once or twice a year, but because they are so busy, they are not always contactable. That’s why SapphireOne’s implementation with Brandscope is so beneficial because our customers have instant access to what we have in stock and they can order it with the press of a button. “It has made doing business with them easier which is something they also appreciate! “To have SapphireOne handling all this with so much automation, and also deal with the standard accounting processes such as payroll, general ledger and reporting, is the reason we’ve stayed with SapphireOne. “When you ring SapphireOne for support, you always get good service. Little problems get solved quickly and bigger problems tend to be our fault for not following the rules!